As the 71st Edinburgh International Film Festival has drawn to a close we reflect on our short film, Nothing to Declare‘s presence at the festival and breath a collective sigh of relief as the dust and mania of production settle and we have been able to start to appreciate the film outwith the sharp focus of production. Audiences at both of the screenings appear to love the film, which has been in competition at the festival for both “The Award for Best Short Film” and also “The McLaren Award for Best New British Animation”. 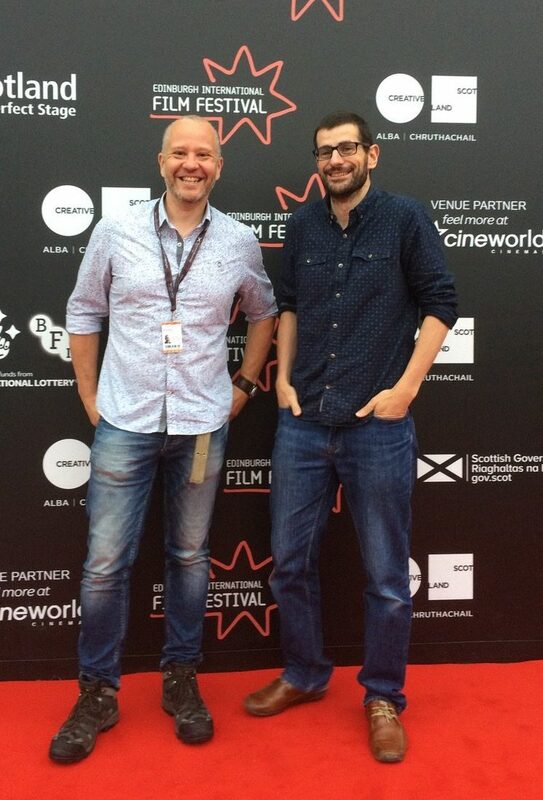 Nothing to Declare’s art director and CGI supervisor, Tom Bryant alongside producer, Mal Young. The film’s premiere screening was as part of the McLaren Best New British Animation screenings, which the Interference Pattern crew attended en masse. It was the first time that some of the artists have seen their work as part of the final film and the response from the audiences and filmmakers alike has been very positive. As well as screening as part of the McLaren awards the film was screened as part of the Shorts: from Scotland which showcased all six of the SFTN funded short films from 2017. As proud as I am of our work on Nothing to declare it was fantastic to see all of the other films that were produced as part of the SFTN shorts programme. An amazing showcase for the filmmaking talent here in Scotland.